Armed with laptops, cameras, scanner, and coffee, Steve Rensberry and I set off Friday afternoon for Carthage, Missouri. Last April, when the two of us had stayed there both en route to and returning home from New Mexico, we had been charmed by the town and hoped to get back there for a long weekend. Now, with some research and an article or two to produce on my agenda, and a weekend with nothing else scheduled, away we went. Since we couldn't leave until the middle of the afternoon, we knew we'd have to drive I-44 most of the way. We did, however, plan for one excursion away from the interstate - Devil's Elbow. This scenic area and important piece of Missouri highway history is about a half-hour's drive south of Rolla. 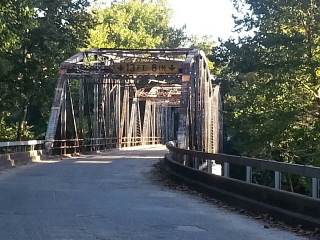 The beautiful old steel truss bridge carried the earliest alignment of Route 66. During the WWII era, the winding highway and small, narrow bridge were insufficient to handle army trucks and other heavier traffic. A four-lane section of highway with a larger bridge was built just to the west. And to the west of the 1940s segment runs I-44 and its bridge - all of these across the Big Piney River. Late in the evening, we arrived in Carthage at the wonderful partially-restored Boots Motel. 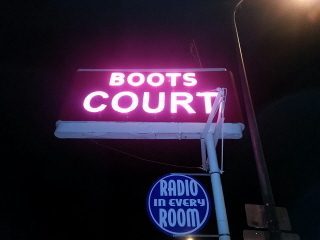 Since my last visit, the restored neon sign had been lit and the "Radio in every room" sign attached. Now on this late summer evening, the pink neon glow was welcoming in the soft dark. Of course, Debye and Debbie Dee were on hand to welcome us as well. I love walking into a room at the Boots...it's as if you're closing the door behind you on the current time and walking into a long-gone era. Tunes from the 40s and 50s play on the old radio (I know, it's a reproduction radio) and the fringe on the chenille bedspreads hangs ever so evenly just above the shiny original wood floors. As the door closes behind me on 2013 traffic noise, the now-muffled sounds from the street are surely those of old engines. I'm pretty sure the traffic I hear is 1940s or 50s - it's a nice thought anyway. I think it's Patti Page on the radio, and before I drift off to sleep, I hear a train whistle in the distance. Perfect.